You read it first on our Facebook page — a Canadian firm is set to purchase FirstLight’s hydroelectric assets. And, as it happens, Montague has a wish list for them. Full coverage of this and other Montague selectboard business in this week’s issue. 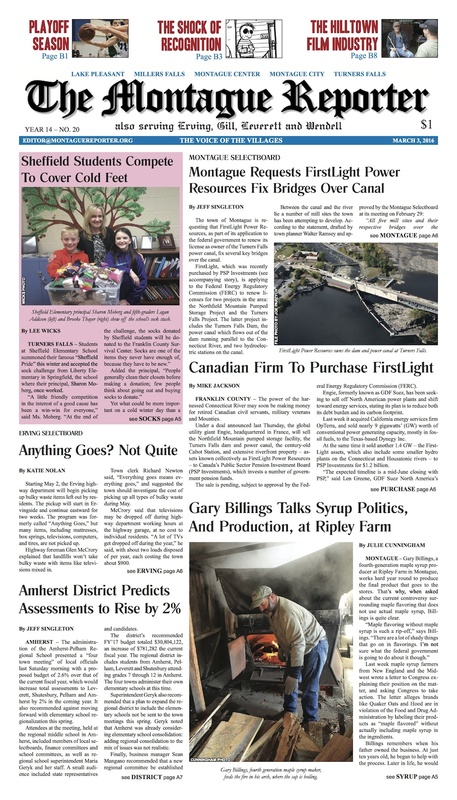 Plus: the latest on Leverett’s school assessment; Sheffield students compete to cover cold feet; we talk syrup and politics with a local maple producer; Erving tackles bulky waste; notes from the Gill-Montague school committee and the Wendell selectboard; Montague and Leverett Democrats prepare to caucus in March; and Part IV of Eye on Town Finances. Our editorial page examines the pros and cons of a “hopping” downtown and offers a clarification and a correction. MoRe: Get ready to Light Up the Shea this weekend! Oystergirl delves into hygiene history. A local teacher encourages us to find our beauty paths. Our science page, NatureCulture, takes an up-close look at how a pipeline might upset the delicate hydrology of our ecosystem. 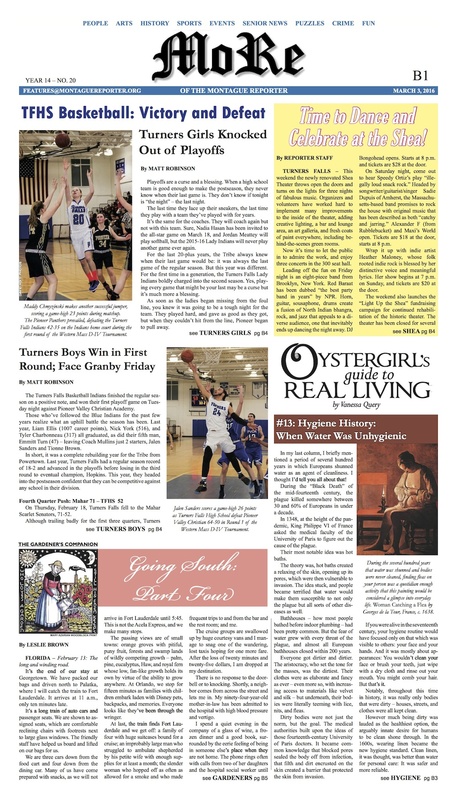 A Wendell filmmaker raises funds for the community by providing “a decidedly different and enjoyable movie experience.” The latest on TFHS and FCTS basketball. The Pet of the Week eschews vanilla. The Healthy Geezer moves on from bigger ears to bigger feet. The Montague and Erving police field what comes their way. Plus, more features, arts coverage, and events listings. Look for this week’s issue in your mailbox, on your doorstep, or at one of Franklin County’s finer retail establishments.